We all know that our tax system allows couples to file their taxes together, but what can a spouse do when they find out their significant other has been filing taxes improperly, or worse, not at all? Is there a way to protect their assets? As it turns out, yes! This program is called innocent spouse relief, and you can file for it if your spouse has gotten into some tax trouble that you had no part in. The IRS understands that there are times a spouse cannot be held at fault for their significant other. However, this protection is hard to get, and it’s granted on a case-by-case basis. 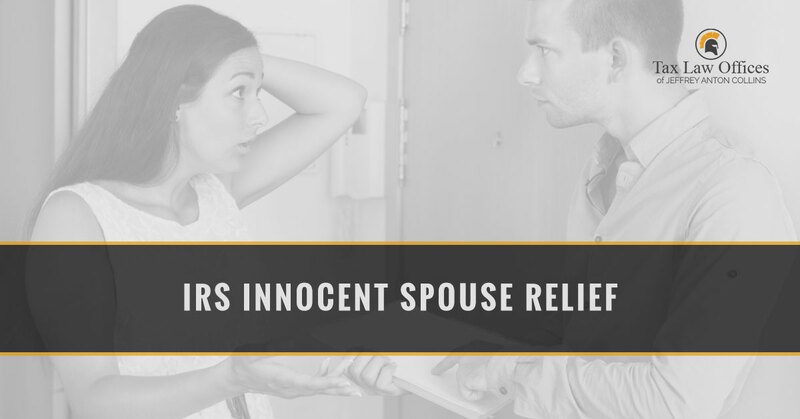 What is IRS Innocent Spouse Relief? Innocent spouse relief is a program developed to protect those who had no part in their spouse’s tax wrongdoings. The IRS has the power to free one spouse of tax liability in the case of unpaid taxes. The IRS will need to evaluate the spouse’s education, work experience, the current marital status (divorced, separated, etc), and disabilities, and the role in household finances to see if they qualify for spouse relief. However, each of these factors will be looked at in comparison to one another. There is no “one fact” that will grant the spouse relief. What will always help, is either being divorced or being in the process of getting a divorce. Keep in mind that saying that your spouse lied to you, or that you didn’t know what you were signing, will not help you get innocent spouse relief. If there is any way you could have known about the tax issues or suspected that the returns were inaccurate, then you will not be granted relief. The same goes for those who have benefited in some way from an incorrect return. In order to have the best chance of being granted innocent spouse relief, you will need to show that you were deceived by your spouse and did your best to ensure that the tax return information was correct. It’s common for one spouse to handle the finances in the home and file the tax return, where the other spouse simply signs it when told and that’s the end of it. Make sure that if you are not the one in charge of preparing the tax documents that you at least read over what is being sent before you sign. Keep in mind that your tax information is a legal document. You and your spouse are both jointly and individually responsible for your income tax returns, even if you do get divorced. Once the IRS finds issues with the return and calculates the amount of unpaid taxes and penalties, both the spouses are required to pay what is owned. What if it is denied? It is very hard to have innocent spouse relief granted, but if you are denied, don’t worry. Sometimes, the IRS will give partial relief even if you do not meet the full requirements. Partial relief is given at the same time the return was filed, as long as you didn’t know or have reason to know of a portion of a false claim. With this partial relief, you can be relieved of tax obligations on a certain item of the income return. A tax attorney is the only way to guarantee that you can receive the best possible outcome for your case. If you suspect that you might qualify for innocent spouse relief, contact Tax Law Offices today. We would be happy to help you and guide you as you navigate this process. Our team is prepared to help you explain your situation in a way that will help you petition for innocent spouse relief from the IRS. Reach out now for a free consultation!